A common treatment for sleep apnea, continuous positive airway pressure, or CPAP, may be associated with the suppression of cancer-related genes. A preliminary study reported in the April edition of the journal Sleep examines the potential link. Read the scientific paper here. An estimated 18 million Americans have obstructive sleep apnea. Their airways become partially or fully blocked several times an hour during sleep. During these breathing pauses, their oxygen levels drop and restful sleep patterns are disrupted. Untreated obstructive sleep apnea can lead to excessive daytime sleepiness, elevated blood pressure, and an increased risk of stroke and heart problems. 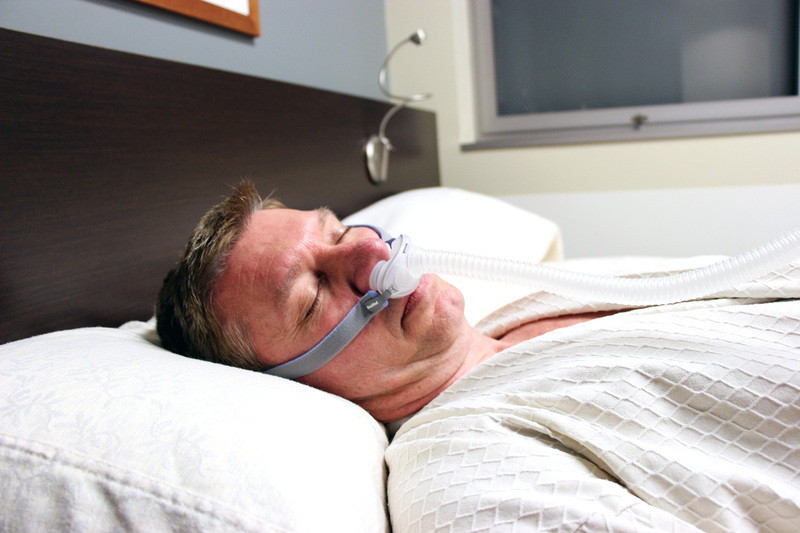 CPAP (pronounced “see pap”) is a small, night table machine that delivers pressurized, humidified air via a hose and a mask worn over the nose or mouth. The device keeps the airways open during sleep. The treatment has been shown to decrease the number of breathing pauses and episodes of shallow breathing, lessen daytime sleepiness, improve control of high blood pressure, and lower the chances of heart and vascular disease, including stroke. Dr. Sina Gharib analyzes genetic data and gene interaction networks in his studies of the effects of sleep apnea and CPAP at a molecular level. Recently, several studies have suggested that untreated sleep apnea might raise the odds of developing and dying from cancer. However, the link between cancer and sleep apnea remains controversial. No molecular mechanisms for a possible connection have yet been discovered.The current study is among the earliest to systematically examine the effects of therapeutic CPAP on gene transcription. The researchers, who are from the University of Washington, Case Western Reserve and Harvard University, recruited adults with untreated moderate-to-severe sleep apnea. They measured the expression of more than 20,000 genes within their circulating white blood cells. They repeated this testing on the same adults after two weeks of effective CPAP treatment. As anticipated, the subjects reported less daytime sleepiness and had lower blood pressure. The authors then mined the voluminous amounts of gene expression and networking data to find pathways affected by CPAP therapy. Unexpectedly, they observed that many of the affected pathways were those that can play a role in abnormal cell changes and growths that can form into cancer. A majority of the genes mapping to these cancer-associated pathways became down-regulated in response to CPAP therapy. According to Dr. Sina Gharib, University of Washington assistant professor of medicine and the study’s lead author, “This is the first report identifying potential pathways and mechanisms linking sleep apnea with genetic programs involved in cancer. But it is important to note that this only a preliminary step in our understanding of how the physiological disturbances caused by sleep apnea adversely affect cellular function." The study was not industry-funded and was supported by National Institute of Health grants NIH HL081385 and CA116867 and a ResMed Foundation Clinical Research Grant to Gharib. Additional funding came from NIH grants HL079114, HL109493, HL108226, and UL1TR000439, and the Clinical and Translational Science Collaborative of Cleveland. Two of the authors received research support in the form of equipment from Philips Respironics. One of the researchers served as a consultant for Apnex Medical, Apnicure, and Vertex Pharmaceuticals. The others declared no financial conflicts of interest.